A parish of the Episcopal Diocese of Rochester, with a membership of approximately 600 persons. A warm Christian family who celebrated our 125th anniversary in 2014. As part of The Episcopal Church, we are part of the worldwide Anglican Communion, and trace our heritage to the beginnings of Christianity. Our liturgy retains ancient structure and traditions and is celebrated in many languages across the world. We uphold the Bible, and worship with The Book of Common Prayer. We celebrate our unity in Christ while honoring our diversity, always putting the work of love before uniformity of opinion. 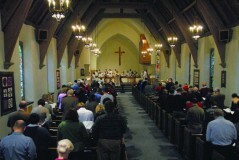 All are welcome to find a spiritual home at St. Thomas’ Episcopal Church.